The MSU250 IR repeater main system unit from Niles is an infrared extender system. This unit enables you to control your IR remote controlled A/V equipment from a remote location. This enables you to place your A/V components out of sight (behind cabinet doors, in the rear of a room, or in a different room) and still conveniently operate your equipment. Installed at the equipment location, the MSU250 receives the IR commands transmitted from your existing hand-held remotes in that room. The commands are carried via a small CAT-5 cable to your A/V equipment in another room, and instantly “repeated”. 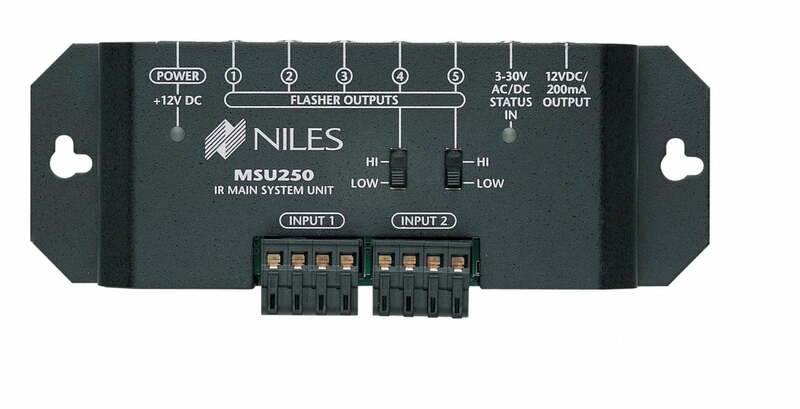 The MSU250 is compatible with all current Niles infrared systems. It may be used along with the Niles TS110, MS110, MS210, WS110, and CS110 IR sensors or the IntelliPad.